The Buddhist texts are not shy about telling graphic stores. In this one, a misbehaving monk exposes himself defiantly to the Buddha. This just shows that life is life, even for a Buddha. “A pleasing note.” This story was told by the Master while at Jetavana, about a monk who had many possessions. The incident is the same as in the Devadhamma Jātaka (Jātaka 6). The Master said, “Monks, this is not the only loss his shamelessness has caused him. In bygone days he lost a jewel of a wife just as he now has lost the jewel of the faith.” And so saying, he told this story of the past. Once upon a time, in the first cycle of the world’s history, the four-legged animals chose the lion as their king, the fish chose the monster fish, and the birds chose the golden mallard. Now the King Golden Mallard had a lovely young daughter, and her royal father granted her any favor that she might ask. The request she made was to be allowed to choose a husband for herself. The King in fulfillment of his promise gathered all the birds together in the country of the Himalayas. All kinds of birds came, swans and peacocks and all other birds. They flocked together on a great plateau of bare rock. Then the King sent for his daughter and told her to go and choose a husband after her own heart. 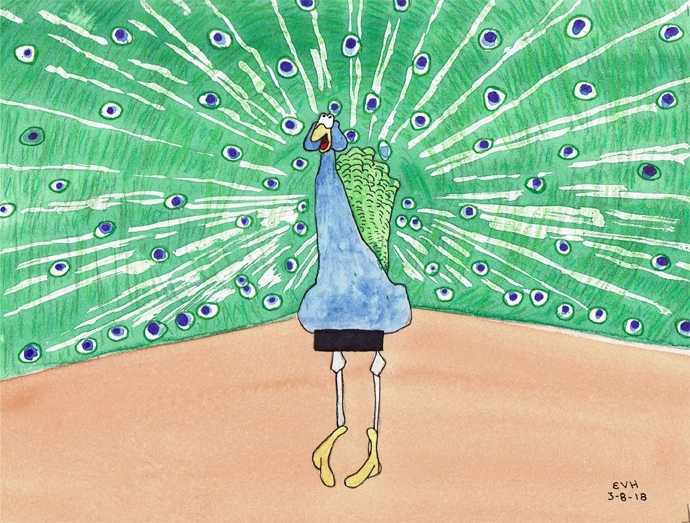 Carried away by his extreme joy, the peacock exclaimed, “Until today you have never seen how excited I am!” And in defiance of all decency he spread his wings and began to dance, and in dancing he exposed himself. A neck in hue like a precious stone. Your outstretched feathers reach the height of a man. But your dancing loses you, my child. In front of the whole gathering King Royal Mallard gave his daughter to a young mallard, a nephew of his. Covered with shame at the loss of the mallard princess, the peacock rose straight up from the place and fled away. And King Golden Mallard too went back to his dwelling place.